Sunshine, warm days and butterflies. What more could one ask of a perfect late fall day in the Rio Grande Valley? The ever-faithful big yellow butterflies are out in numbers, commanding attention as they flash their bright, yellow wings. They are named Phoebis, or sulphurs, and these mid-sized beauties are year-round residents of southern Texas. Appropriately named, Little Yellow butterflies are also in abundance-although not nearly as flashy, bright or big. Perching on tiny blooms, with its wings closed, each Little Yellow could fit on a nickel. These are categorized as small sulphurs. Identifying butterflies using field guides involves a close look at marks on the species wings. Among the Little Yellow’s numerous tell-tale marks, the most noticeable is a pink to cinnamon colored spot found at the hindwing upper angle apex. Other identifiers include the pinkish fringe at the edges of the wings, and the two tiny black dots at the base of the hindwing. These two dots distinguish Little Yellow from two other small sulphurs, the Mimosa Yellow and the Barred Yellow. While Little Yellow is common in the Valley, the Mimosa and Barred small sulphurs are not so much. These latter species can be found just at the top of the northern range. Little Yellows fly a direct path close to the ground. The big yellows fly high with an erratic flight pattern offering loop-de-loops and other aerobatic maneuvers. According to some references, adult big sulphurs are attracted primarily to red, orange, and purple colors. That may be. While the big yellows head toward the orange grove and native plants with larger flowers like the red-blooming Turk’s cap (Malvaviscus drummondii), orange and yellow Texas lantana (Lantana urticoides), and purple, fall blooming mist flower (crucita, Chromolaena odorata), the Little Yellow is happy to stick around the tiny white flowers of heliotrope, Heliotropium angiospermum. Heliotrope is an all-time favorite native nectar plant. It blooms in all seasons, providing nectar for resident butterflies all year. Generally, it attracts the smaller butterflies like duskywings, metalmarks, blues, checkerspots and white peacocks. The tip of the flower stalk arches similarly to the tail of a scorpion, which has dubbed it the alternate name of scorpion’s tail. The Cloudless Sulphur is the palest yellow of the three, with more distinguishing marks and a rim of brown wing fringe. It measures nearly two inches from top of forewing to bottom of hindwing when it is perching. The Large Orange Sulphur is a deep yellow and the Orange-barred Sulphur, an even deeper yellow. 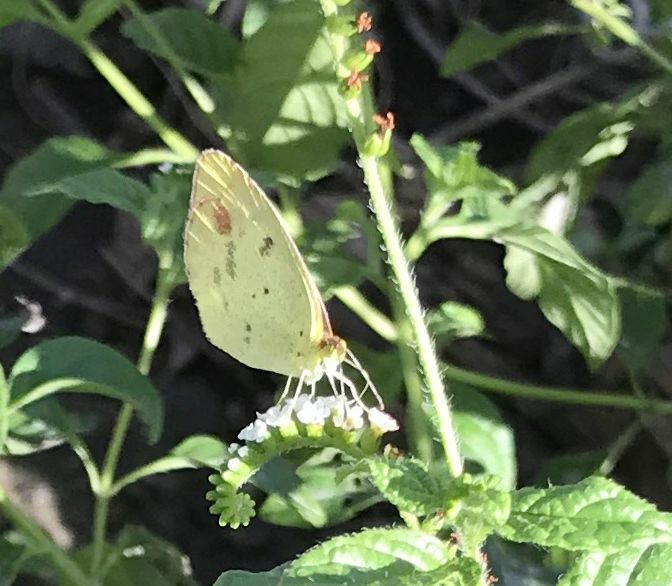 The Orange-barred Sulphur is the largest, and although its deemed uncommon in Texas, it is a regular here in the extreme south. Interestingly, the male of the species has broad orange bars on the hind wings that flash an unmistakable orange color in flight. Anita Westervelt is a member of Rio Grande Valley Chapter, Texas Master Naturalist organization.